A school of fish roils the surface just off the Sugarloaf, as birds dive to dine as well. Captain Ben of the Bright Arrow said the the focus was a school of very small fish, darting to the surface to avoid being eaten by the larger predatory fish and the birds. The Buller's Shearwater breeds only on the Poor Knights Islands. However, it's a Pacific traveler, and is common off the California coast. Here they are in relatively small numbers, in December early in their breeding season, with the smaller Poor Knights Islands (the "Poor Squires") in the background. Hawks do plenty of different things while they're hovering and flying. They're curious about their surroundings, and spend time using their remarkable vision to examine animals that aren't possible prey: like the photographer. These 8 images of a hummingbird were made over a period of about 7 seconds. The exposures were about 1/1000 second each, so those wings were flapping a few hundred times per second. They were humming, all right! Western double-crested cormorants show the white feathers above the brow. The green eyes of cormorants are astonishing. Why are they green? The campgrounds at Refugio are closed this time of year. Gophers are as plentiful as ever, though. On the day before Christmas, this hawk moved in to partake of the feast. The swings in the deserted campground make a great perch to survey the meadow for hawk treats. 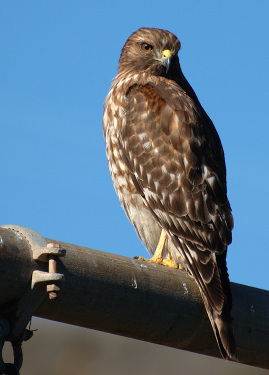 I believe that this is a red-shouldered hawk. 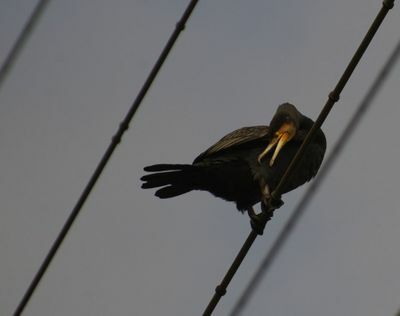 This cormorant was one of a flock, sitting on power lines over a narrow creek. It looks much like California cormorants, although with a different facial color and a more industrial setting. 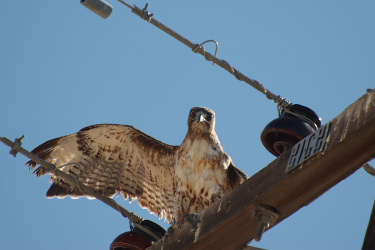 This prairie falcon was sitting on a power pole just outside Carrizo Plain National Monument when a couple of humans drove up and began photographing him. 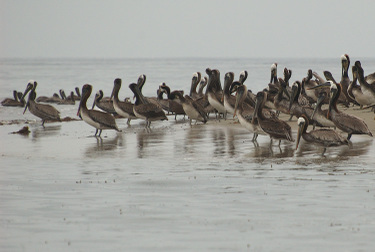 Brown pelicans start the day from the sandspit at Santa Barbara Harbor. This is a favorite roosting spot, ever since work on the breakwater blocked public access. 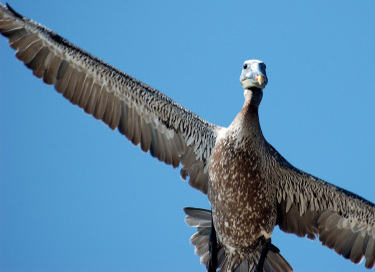 Pelicans don't have many places to rest, along the coast; the islands are friendlier.